It’s time for a new update to the BIGLIST review of SEO blogs. I started with a list of 15 new blogs in a queue for this update and four made the cut. Once a new blog hits our radar, we watch it for a few weeks before reviewing. Broken links, neglecting to post (far too many one trick pony SEO blogs out there) or design that makes content difficult to consume are all reasons not to be included. 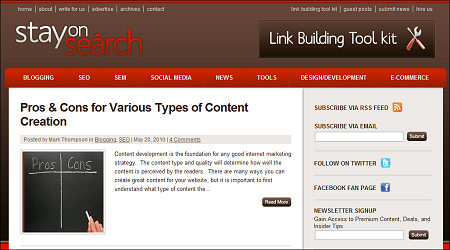 This update includes a mix of individual and agency blogs, all primarily focused on SEO. Stay on Search – This update of the BIGLIST gives design recognition to Mark Thompson for his Stay on Search Blog. Besides offering a consistent post format with images and template, Mark blogs a lot of how-to and tips posts along with a much better than average effort at being truly useful. Great design plus great content = a blog worth subscribing to. Maile Ohye: Love & Technology – A smart sense of humor and informal insights into various Google and webmaster topics makes this personal blog by Google employee Maile Ohye worth a BIGLIST inclusion. AgentSEO Blog – Written by Jacob Stoops, this web site/blog provides personal entries on SEO with a side of SEO and plenty of SEO after that. Actually, the AgentSEO blog contains a very smart structure of content including video, useful resources, smooth display of Twitter, RSS options and Facebook plus an obvious but not offensive call to action. The bottom navigation is very different than most blogs and so far, that seems like a good thing. Epiphany Digital Marketing Blog – This UK agency offers a mix of internet marketing posts from agency staffers on search, social and industry topics. Many of the posts go into detail about insights, testing and general observations from solving digital marketing problems. Did your SEO or SEM blog make the cut? Share the good news with your readers using the badge and link from the badges page. I really, really, REALLY hate DISQUS. You have no idea of who I am because the idiot who designed the service didn't allow for names as long as mine. That is odd. Unfortunately, Disqus only offers two options: free and way too expensive. Impressive list. Except one – (Epiphany, where I'm a regular) – other are completely new to me. Will have to subscribe them after going through stories. But I really like the way Maile Ohye presents her topics – she got a really good sense of humor and can make boring things pretty enjoyable. Thank you for the list. I have two of them bookmarked now. Thanks for the list. Very useful. Thank you for the list .she got a really good sense of humor and can make boring things pretty enjoyable.I believe that my blog should be included on this list a year from now . Hi Lee, thanks for the mention of my blog! I really appreciate it.